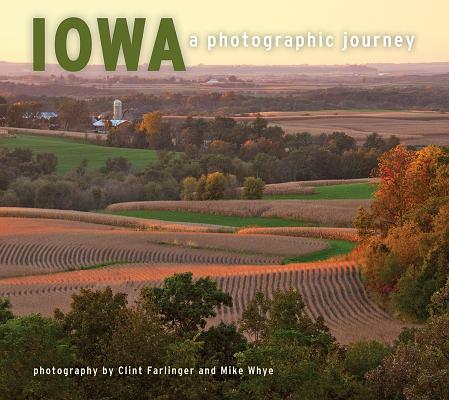 Iowa residents Craig Farlinger and Mike Whye need no words to explain how incredible their home state isthe proof is in the 109 color photographs that make up their new book, Iowa: A Photographic Journey, available from Farcountry Press this fall. Working independently from Cresco and Council Bluffs, respectively, Farlinger and Whye have covered nearly every corner of Iowa in their 54 combined years of professional photography. In "Iowa: A Photographic Journey," the duo delivers not only the cozy farm scenes and small-town charm that make the state great, but also a wide variety of true-blue Iowa subjects visitors and even locals may not have previously seen. Although both photographers are well rounded, "Iowa: A Photographic Journey" brings out their individual strengths. Farlinger takes readers on a journey through majestic natural places, including Iowa's beloved state parks, old-growth forests, limestone bluffs, winding rivers, and the unique prairies of the Loess Hills. Whye highlights the state's culture, from the famous covered bridges of Madison County to the golden Iowa Capitol, from the freewheeling sculptures of Pappajohn Sculpture Park to the two-wheeled extravaganza RAGBRAI, and all the rodeos, museums, historical sites, and giant concrete bulls in between. The book's images reveal a rare passion for all things Iowa. If, as the old saying goes, a picture is worth 1,000 words, Farlinger and Whye have composed a splendid love letter to the Hawkeye State.